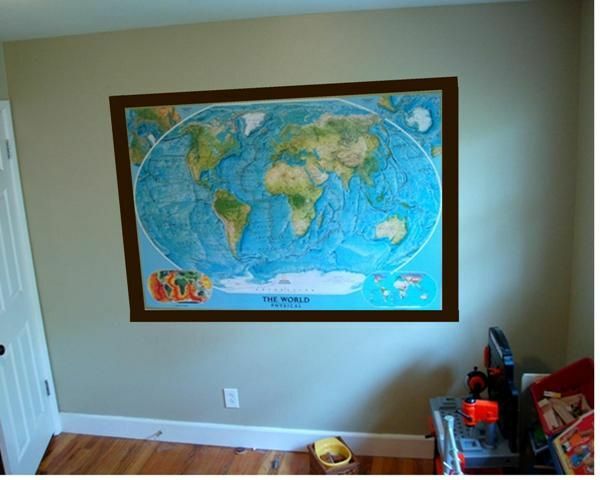 I love the idea of using maps as decor, and I think it will be nice for my boys' room because it's not really age-specific, and it reminds me of adventure and hopefully it will inspire their imagination and help them grow up thinking about other places and other people. It's educational and cool. I ordered an oversized physical map from csn.com -- I went with a physical map because I wanted the greens/blues/tans for the room, because those are the colors that I wanted to pull out for the rest of the room. 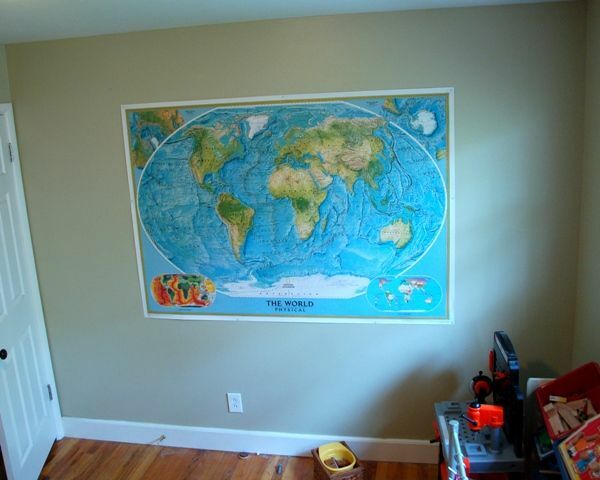 I also wanted a large map to make the most impact on my boys' giant blank wall, and this map is almost six feet wide. So although my boys won't be learning any lessons on state and country capitals, they can ooh and aah at giant lakes and mountains. I'm sure there will be much oohing and aahing. There better be oohing and aahing. When I hung the map, I originally tried to be all crafty and smart by using some reusable Scotch-brand adhesive squares I found at the store, and even though I ended up using 8-9 of them on the back of the map, they didn't hold well enough and I finally used white thumb tacks to keep the map on the wall where it belongs. Now I just need to decide what I want to do under the map, since it does take up a lot of space. Decisions, decisions. Y'all know I feel about those. NICE! I love maps, and collect vintage globes as well. I've got a nearly 300 year old map of Italy (my mother's motherland!) on my wall that I got from an antique dealer, it came out of an old European atlas. But I really like this idea of a huge world map on the wall, it's quite scholastic. If I had an office, one of these maps would be the first thing I would put up. I really like your choice of the physical map, and I'm thinking bookcases with perhaps a padded seating area on top would be nice for the boys' room. One of these maps is officially on my Christmas list. (Thanks for introducing me to this website. They're so affordable!) I know I want the BIG one, but I'm not sure about the laminated version. I don't want a glare when the lights are on, but I also want it to be durable. Did you buy the laminated or unlaminated version for your boys? P.S. 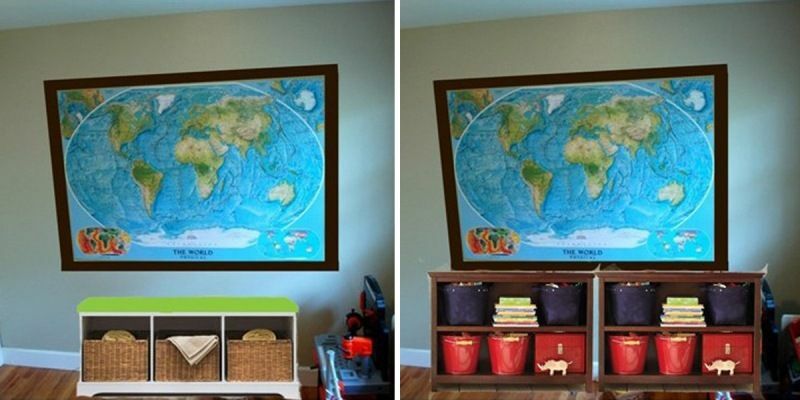 I like the look of the last photo- with the long toy storage bookshelf, but I'm not sure you'd be able to open the door all the way.